gThumb, an image viewer and organizer, has reached version 3.1.1, adding support for WebP, the image format that employs lossy and lossless compression, developed by Google as a WebM sister project. The new version also comes with a new application menu on the top GNOME Shell bar when used with GNOME Shell. Enhance colors: use a faster algorithm and rename to "Adjust Contrast"
Desaturate tool: added ability to choose the method to use, renamed to "Grayscale"
Also, with this version, gThumb depends on GTK3.4 so for instance, it can't be compiled on Ubuntu 11.10 (and obviously older versions) anymore. 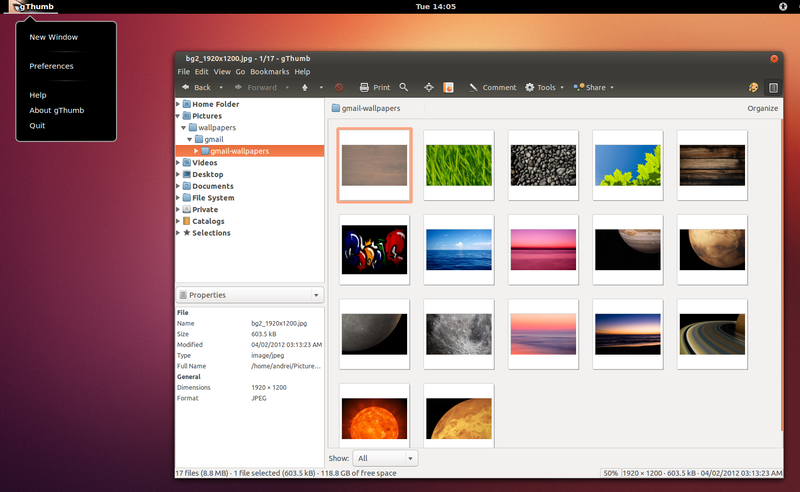 For other Linux distributions, get the latest gThumb from HERE. Other packages from our PPAs updated today: Audacious 3.3.2, UMPlayer, Subtitle Editor 0.40.0.